It all started in a confessional booth. Cyndi Rhoades of Anti-apathy has a mobile fashion confessional booth she takes to workshops and festivals. In the summer of 2006, she took it to a local festival in London. Tamsin Blanchard, the Style Director of Telegraph Magazine and a longtime fashion journalist, who was helping to organize an eco-fashion day at this festival, decided to take advantage of the opportunity and went to confess at the confessional booth. These moments at the booth were epiphany moments for her. "I went to confess my fashion sins and from then, I really began to seriously consider the issues of pesticides in cotton, fairtrade clothing, clothing dyes, recycling etc." she told me. She acted fast and one year later she launched her new book: Green is the New Black: How to Change the World with Style. The book is a guide to everyone who is looking for ways to green up their lifestyle, without compromising on style, quality, being fashionable, etc. 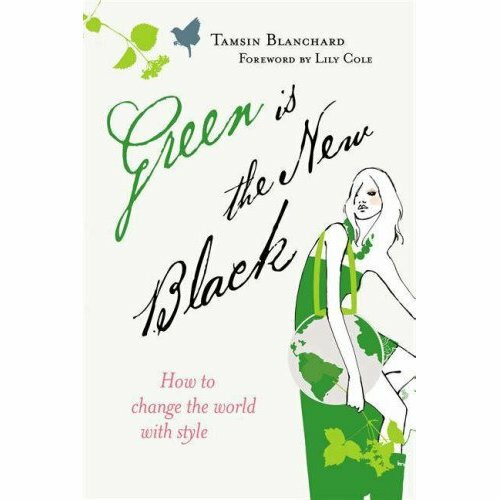 Nowadays you can find a growing number of books written on different aspects of green consumerism, but this is the first one written by a fashion journalist. Naturally, it focuses on topics such as eco-fashion, eco-style, green weddings, eco-friendly shoes and bags and getting the (green) look. In addition the book also presents the alternative way to be green and fashionable - DIY. Blanchard, knowing very well the significance of recycling, gives many tips how to make clothes and accessories from materials you can find at your home and your closet, including how to organize swishing (clothes swapping) parties. I was recently honored with the opportunity to speak with Tamsin Blanchard for an article I made for the web-edition of Maariv, Israel's second-largest newspaper on her book. You are welcome to read on her thoughts on green living and which of her green tips is her favorite. What brought you to write this book? to whom it is written? As a fashion journalist, I have seen the high street begin to take note of the issues surrounding eco and fair trade fashion. The consumer is beginning to ask questions and I felt it was the right time to supply them with the information - written in an accessible and unworthy way. The book is aimed at anyone interested in fashion who also has a conscience. What's the most interesting stuff you have learned about eco-living while working on the book? That there are so many great alternatives, from fantastic fair trade jewellery (made on the slums of Kibera by the ethical jewellery company Made) to fantastically cool chrome free leather shoes by Terra Plana. You are described as someone who is bringing eco-living to the masses - do you think the masses really care about eco-living? isn't it still something that only people with financial capabilities can afford? Even if only 5 % are interested in making a change, then they are worth communicating and engaging with, and hopefully, the message will spread to everyone. We now all have to recycle our rubbish or we get fined so nobody can ignore eco-living completely. 10 years ago, fairtrade bananas and coffee were a niche product bought by a committed few. Now they have become totally mainstream. Change happens quickly. What's your reply to the critics of green consumerism, like George Monbiot for example, who believe it causes more damage than good by giving us an illusion that we can fix the world with a couple of efficient bulbs and a pair of organic cotton jeans? Nobody is going to stop buying jeans. Why should we? We are not living in the dark ages and whether we like it or not, we are a society of consumers. Shopping has become one of the most popular forms of entertainment. If we can get people to direct their spending power in the right direction, then perhaps more people will be paid a fair wage. Sure, we need to cut down on how much and how quickly we are consuming, particularly in fashion. I do think we need to slow down, buy fewer, better quality items, and respect the things we buy - looking after them, mending them, making them last as long as possible - so that we stop throwing things away so readily. Cheap, fast fashion, in particular, is a false economy as it falls apart after a couple of washes. It seems that the options for men are relatively limited when it comes to eco-fashion. What's your advice for those of us who happen to be men, but still want to be fashionable, cool and green? There are plenty of organic jeans around now, (including Levi's) and there are labels like Katharine E Hamnett, Loomstate, and Howies that cater for men who want to be green and fashionable. Support those labels and other companies will follow. How many of the tips you provide in your book you implement in your daily life? what's the one you like mostly? Washing your clothes at 30 degrees. They still come out just as clean! What you see as the hottest trends in green living in the next couple of years? is there any area that we should follow in particular? We will be seeing more alternatives to cotton (even organic cotton - it's so water intensive that it is not sustainable). Fabrics like bamboo, soya, interesting mixes with hemp, washi etc will be more widely available and will filter into designer lines as well as the high street. What's the most important advice you can give to someone who really wants to change the world and make it greener, but with style? Don't compromise on style. Be confident in your own style and don't follow trends. Ask questions about where your clothes were made. Slow down. Your book is about green living. Does it also 'walk the walk', i.e., printed in an environmentally manner (using recycled paper for example)? The book is made from wood grown in sustainable forests. The hard coverboard is recycled. And I encourage anyone who has a copy to pass it on to a friend once they have finished with it! This green book review was originally posted on Eco-Libris blog. Copyright © 2007 Eco-Libris. All rights reserved.